World Book Day arrives on Thursday 5th March and we asked our friends at Scholastic for their top tips on how to enjoy World Book Day – at home, at school, online and at the various events happening around the country! Is there anything better than sharing a book with the kids; be it at bedtime, story time or for occupying the kids on the go, books are great! This is why we’re big fans of World Book Day, a massive celebration of all things reading, book and story related. What’s not to love? World Book Day takes place on 5th March and there are loads of fun ways to get involved. From one of the brilliant author events taking place that week, to online resources and author videos. Or you could share a story with your kids, and then continue the story off the page with our top five tips for celebrating World Book Day. 1) Get busy with activities. Have a look for activity sheets that star your child’s favourite book characters and get busy colouring, cutting, sticking, quizzing and chatting about the characters and stories. 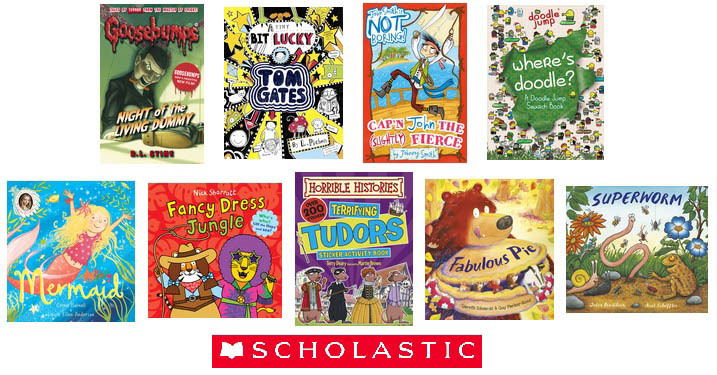 We’ve got a whole heap of activity sheets to choose from over on the Scholastic website. 2) Chat about the books you read. After finishing a book, chat to your kids about the story – Which bits do they love? Would they have changed the ending? Which character did they most identify with? They could even write a book report about a favourite book. 3) Get creative. Get your kids to draw characters or scenes from a favourite book, purely from the description in the book. 4) Attend a book event. Whether it’s at your local bookshop or library, at the kids’ school or one of the big World Book Day events, inspire the kids to read by taking them to a live author event. There are a number of Scholastic authors appearing at events across the country for World Book Day’s The Biggest Book Show on Earth tour so why not head to one of them? Martin Brown. Thursday 26th February, Bath, Bath Pavilion. Liz Pichon & Nick Sharratt. Monday 2nd March. Glasgow, Glasgow Royal Concert Hall. 5) Dress up! Be inspired by your child’s favourite book character and get dressed up for World Book Day, whether it’s Harry Potter or Katniss, Tom Gates or Matilda, there’s bound to be a book character they want to dress up as! 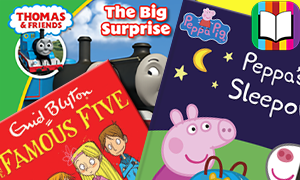 To celebrate World Book Day, we’ve teamed up with Scholastic to give you the chance of winning a big bundle of books! We have two bundles to give away, so pop over to our Competitions Page and enter! PLUS enjoy Member Benefits including £10 worth of FREE MeBooks, exclusive to LittleBird. Join today – its free! and head over to our Member Offer’s Page, get your code and claim £10 worth of FREE e-books from our friends at MeBooks!